It wasn’t my fault. Someone else started talking about pies and the conversation moved on to plunge pies made by Mike Turton Family Butcher in Ilfracombe High Street. 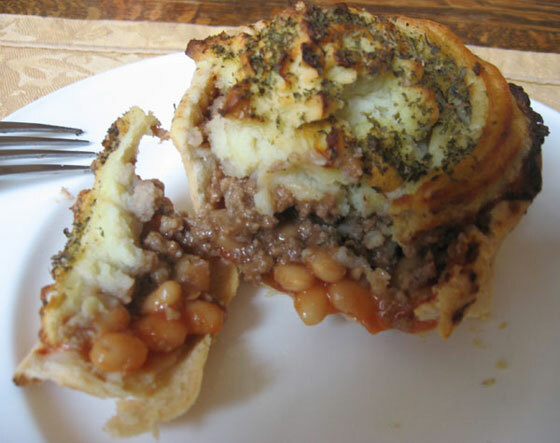 It’s a pie outer filled with mince and baked beans and topped with mashed potato. So what did I want for lunch today? A lovely meal in itself on a chilly November day. Posted in food & drink. Tagged with Devon, Ilfracombe, Mike Turton Family Butcher, plunge pie. If carlsberg did pies these would be them. This is the reason right here “A lovely meal in itself on a chilly November day” i have gone from 12 st to nearer 14st in the last 2 yrs lol. But they work equally well in summer trust me. I have sampled a few plunge pies from Turton’s and thought I would see if there was a recipe on the web which is how I came to your site. Spot on with the comments about the pies, absolutely lovely and there isn’t a recipe on the web……..comes up with peach pies, thanks google! Who wants a pie made from a hairy fruit when you can have beef, beans and spuds? If you want something to wash the pie down with try cider from Indicknowle Farm, Long Lane, Comb Martin, Ilfracombe, Devon EX34 0PA. They also have honey and eggs – try a goose egg for breakfast. That’s because Turton’s invented them – I asked where they came from.